Gute Luft Is The Result Of Months Of Work Scoring The Hit German Tv Film 24h Berlin - The Longest Documentary Film In History Which Featured 80 Camera Teams Following The Lives Of Berliners Over A 24 Hour Period. Obviously A Huge Challenge For Fehlmann, Beyond The Scope Of The Project And Hours Of Music Involved In A 24 Hour Film, There Was Dealing With The Decision Making Process That Went With Working With Such A Large Production Team. As He Shared Scoring Duties With Another Musician (Separately), Inevitably A Lot Of His Music Ended Up Not Making The Final Cut. Gute Luft Is About Re-Tweaking And Editing Material From The Countless Hours Of Recording He Had Created. 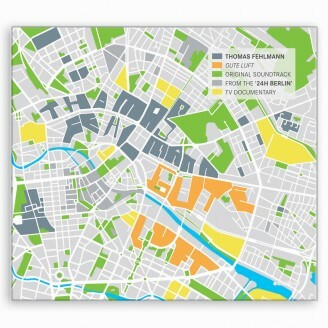 In A Sense, Gute Luft Is Fehlmann's Ideal Soundtrack To The 24h Berlin Documentary. Fans Shall Rejoice As Thomas Fehlmann Doesn't Veer Far From His Signature Path Of Trailblazing The Finer Links Of Classic Detroit House And Techno With The Submerged Beauty Of Berlin Dub. One Will Immediately Recognize The Classic Scoring Techniques Fehlmann Brings To Gute Luft - Various Themes And Sounds Resonate In Various Forms And Versions Throughout The Tracks. As Thomas States, “There Are Also More Subtle Connections That Should Give An Overall Feel To The Score. I Also Brought In Elements From Tunes From My Previous Albums In Recognition Of The Fact That I Often Feel That There Would Be So Many More Ways To Explore And Experiment With Certain Ideas Than Just On A Single Track”. Fehlmann Clearly Succeeds In Synergizing The Best Of The Past 20 Years Of Berlin's Expansive History Of Electronic And Dance Music With Gute Luft. A Recreational Album In Every Way In Which He Hopes Will Make You “Feel At Peace With You And Your Environment, Inspire You To Lush, Imaginative Dinners, Make Babies, Or Just Walk Your Own Way With Open Eyes”. Well Put Thomas!